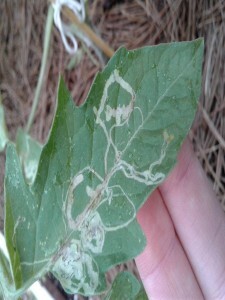 Yes, this is leaf miner damage. It is difficult to control leaf miners because you have to apply treatment when the adults are mating prior to laying the eggs on the plant. Once hatched the juvenile insect enters the leaf and is protected. You could use a systemic insecticide to protect the plant. We usually do not recommend treatment since the pests do not usually cause significant damage to the plant. However, the infested leaves can be removed and destroyed.